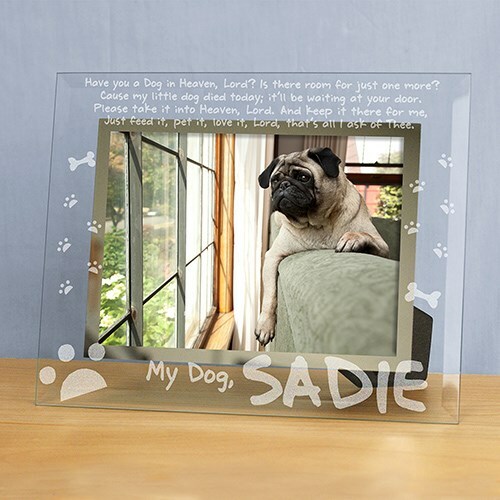 Personalized Dog Heaven Pet Memorial Glass Picture Frame. Honor your four legged friend with of beautifully Engraved Pet Memorial Frame. Always love your pet with a special wood frame. Honor how much love and joy your companion has brought to your home with our attractive Personalized Dog Memorial Picture Frame. Remember your pet in style with a beautiful picture frame. You will always remember the joy & happiness your dog has brought to your loving family. Have you a Dog in Heaven, Lord? Is there room for just one more? Cause my little dog died today; it'll be waiting at your door. Please take it into Heaven, Lord. And keep it there for me, Just feed it, pet it, love it, Lord, that's all I ask of Thee. Up to 16 letters.